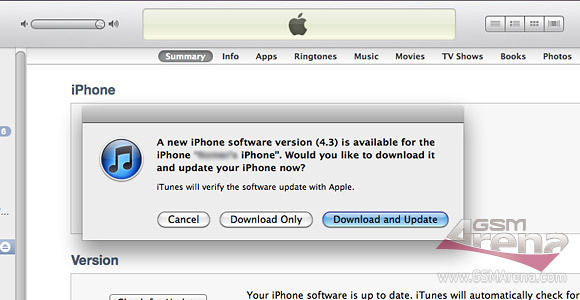 Today we were nicely surprised to see iTunes greet us with the latest iOS 4.3 software for the iPhone 3GS and iPhone 4 well ahead of schedule. The update brings a handful of improvements including faster web browsing, iTunes Home sharing support, enhanced AirPlay support and, of course, the Mobile hotspot functionality. In general, there's nothing new we didn't already know about. Nevertheless, the update is a major step forward for the devices lucky enough to get it. Don't waste any more time, jump right ahead to your iTunes to get the download. Don't forget to share your thoughts on the iOS 4.3 in the comments bellow.